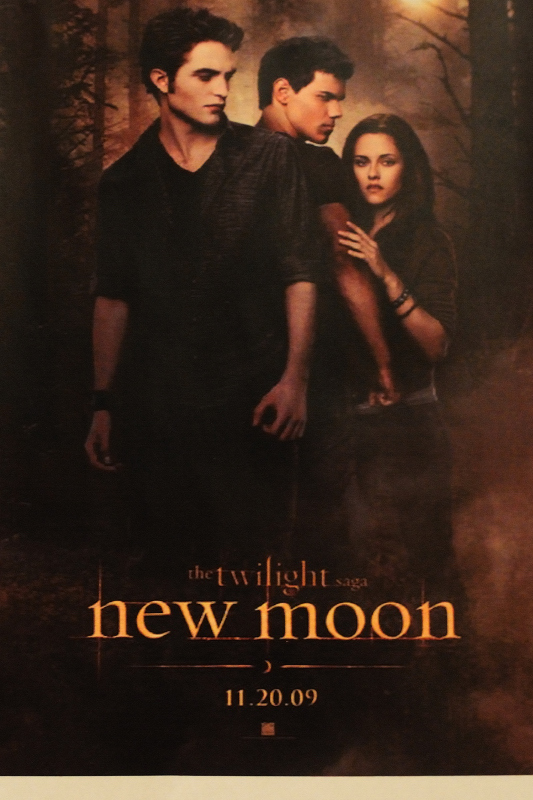 Of course, how could we go through this weekend without some mention of the highly anticipated opening of the New Moon movie? Well, here is my [boring] contribution to the countless blogs devoted to all things New Moon and The Twilight Saga. We have this hanging in our kitchen, along with the kids' art work and other random print outs. I am the first of the family to see the movie. Erica will attend later this week with a group of friends, and Scott will go in a couple of weeks (when it is less crowded - and he might take Brian). The theatre was crowded for a Sunday afternoon matinee, the audience comprised of mainly female, mainly tweens. In a nutshell, the movie covered all of the main parts of the book, although it moved along at a snail's pace. Our group of 30-40 year old women are in the "Team Jacob" camp (and watching the movie confirmed our choice). Pardon the interruption - I stepped away from the computer momentarily. So, we all enjoyed the movie. I'm sure those who are big fans of the Twilight Saga will enjoy it as well. I just don't want to see so much of Rob Pattinson in the future. 'Nuf said.